The basic steps in making herbal and fruit vinegars are quite simple. Your goal with herbal vinegars is to add flavor and zest to your diet, however, herbal vinegars are so healthy some proclaim them a miracle cure all. Vinegar may just be one of the most powerful home remedies available to us. Herbal infused vinegars are simply amazing. Remedies for rosemary, sage and tarragon vinegars, using vinegar to preserve herbs, and recipes for facial rinses and hair conditioners. Experiment with various herbs to develop your favorite flavor. Any consumable herbs can be used alone or in combination. Use a basic white or red wine, or cider vinegar. You will find many combinations that not only offer great taste, but extra added health benefits as well. I often take the last cuttings from the garden in the fall, to savor and save taste of summer. Remove any dirt and debris from fresh herbs, and use only the best leaves, discarding those that are discolored, or have been munched on by insects. Spray wash, spread on newsprint and let the leaves wilt and dry on the stems. This step also lets any unwanted visitors clinging to the leaves depart. 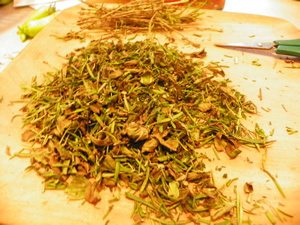 Remove	leaves from stems and cut into small pieces. 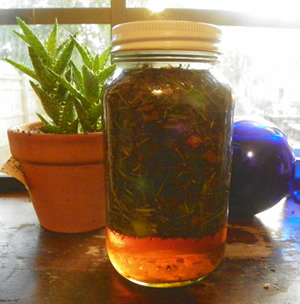 When making rosemary vinegar, conserve the woody stems for the kindling box. Heat the vinegar gently till hot, (not boiling). Pour heated vinegar over herbs and let infuse in a covered container for 2 to 3 days, or weeks depending on the recipe. 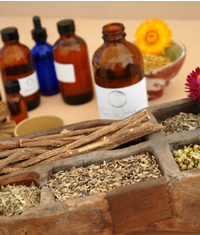 If you are interested in extracting medicinal properties from herbs, the infusion time will be in longer rather than shorter. Infuse at room temperature away from direct sunlight. Kitchen cupboards are ideal for this. Shake the bottle every few days. 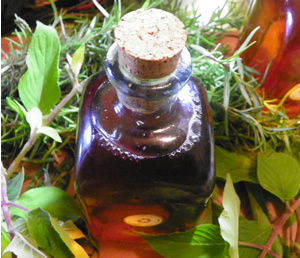 Strain - remove all organic materials, then pour herbal vinegar in a clean dry bottle and cork. Vinegar causes metal to deteriorate, so if you can't find a plastic or cork to fit the bottle of your choice cover the opening with wax paper before screwing on the lid. You can add back some sprigs of herbs or berries for decorative purposes, but make sure they stay submerged in the vinegar. Most flavored vinegars will last for months when stored in a cool, dark place. (refrigerator is fine), but for optimal flavor use within 3 months.